Stands Unique Limited has voluntarily ceased trading due to the detrimental UK economic climate. "It's impressively built, very imposing and handles music capably - if you're after something that's going to last a lifetime, audition this." 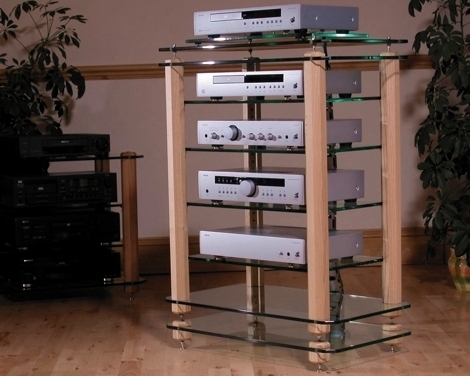 "Amazing build quality; great looks; fine detailing; smooth treble; fluid midrange"
The Chunky Sound Tower 10 was reviewed without the Isolation Platform And Floor Isolation Slab shown above. 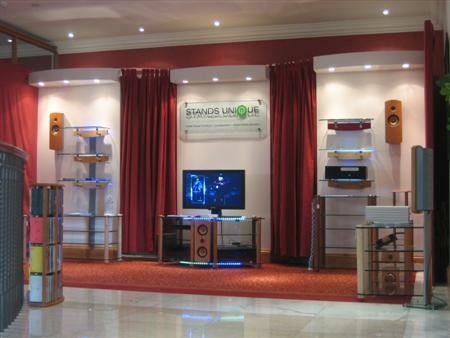 Here we are again at The Bristol Hi-Fi Show held at The Marriot Hotel on February Thursday 20th - Sunday 22th 2009. David and Rod were there answering all questions. The new backlight L.E.D lighting system went down very well. This is how this years 2009 stand looked.